I love to put homemade noodles in chicken noodle soup. They remind me of my childhood. My grandmother made the best homemade egg noodles. As a young girl, I remember sitting on the kitchen stool in her tiny kitchen with avocado green appliances watching my Granny roll out the dough, cut the noodles with her big knife (the one pictured below), then carefully shake them out. They were cooked in the broth she had made from baking a roast earlier in the day. 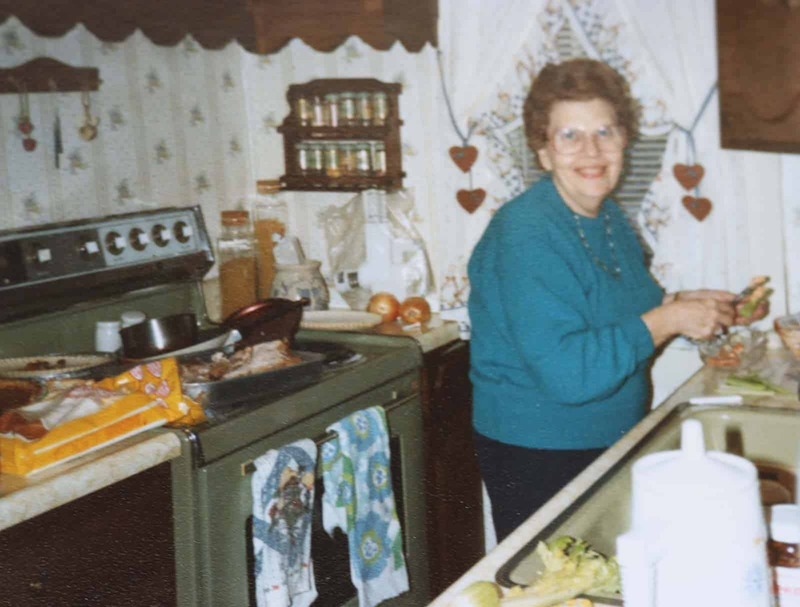 She always served them for Thanksgiving, although would make them whenever I came to town as she knew I loved them so much. Around the holidays there was always a big debate at her house about the best homemade noodles. Granny insisted you never let them lay out to dry while other relatives disagreed and said you should let them dry. But I’m loyal to my grandmother, I make them the same way she did and never let them dry and always cover them with a towel if I’m not cooking them immediately. Granny in her tiny kitchen, I sat on the stool to take a picture of her cutting vegetables. Amazing all the wonderful things she could cook in this tiny kitchen. Homemade noodles taste incredible in chicken noodle soup and make the perfect comfort food! Over the years I have developed my own chicken noodle soup recipe and make it whenever my kids are sick. One day I decided to try freezing the soup because when I’m sick, it’s usually canned soup for me-and that’s just not right! Luckily this soup freezes beautifully so now if I’m feeling sick, I pull out a bag from the freezer, reheat and have a hot cup of this delicious soup. A similar version of this chicken noodle soup recipe is in my Amy’s Favorites cookbook that I published back in 2010. I have lightened this version to make it healthier and have also made it Instant Pot friendly. This recipe still takes some time, but not as much as the original version and believe me, it’s worth it! And only 4 points per cup for a bowlful of delicious chicken noodle soup yumminess! If you freeze it into portions, then you can have it quickly whenever you want! 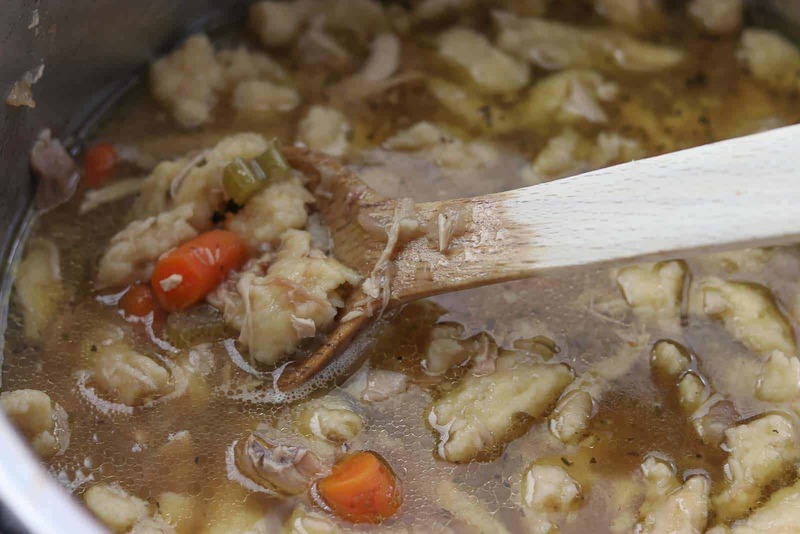 How do you make good old fashioned chicken noodle soup? 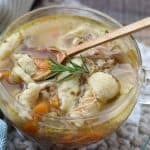 This chicken noodle soup recipe may seem confusing at first to cook the chicken and vegetables, then strain the vegetables and throw them out, but you have to make a great chicken broth first. The broth is the key to making great old fashioned chicken noodle soup. By doing it this way, you have double the vitamins and double the taste. Make the broth by throwing all ingredients in Instant Pot, then pressure cook for 30 minutes on high. No need to cut up vegetables finely. The Instant Pot does all the work of taking out the nutrients for you. Strain out the vegetables, throw away. Take out the chicken and debone. This can take some time but try to get all the good meat separated from the bone. Sauté a new batch of vegetables, throw back in Instant Pot along with deboned chicken. Cook again. Make the noodles, add to soup and cook for just a few minutes. That’s it! Do I really need to make the homemade egg noodles? How do you make them? Yes, it literally takes no time and the difference between store bought noodles and homemade noodles is tremendous! After making this soup for years with homemade noodles, I once substituted store bought egg noodles and wow how my kids complained! I didn’t think they would notice it too much, but they did. Making noodles isn’t hard at all. Just follow my directions. Combine the flour, baking powder and salt. Beat the eggs first, then add them into the flour mixture and combine with a fork until it comes together. If needed add 1/2 egg shell of water. Be sure not to overmix the dough, otherwise the noodles will be “tough,” and you want them tender. 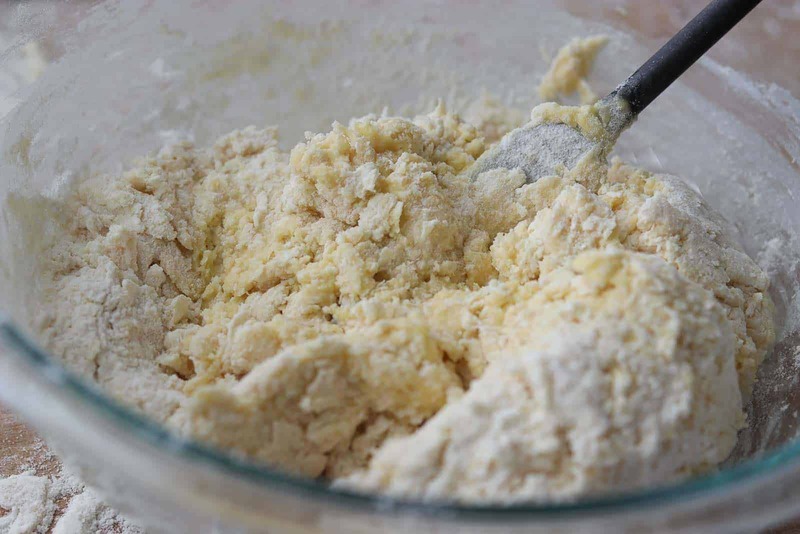 Knead the dough about 3 times using more flour if the dough seems to stick too much. Cover with a towel and let the dough rest for about 15 minutes before you roll it out. Then lightly roll out the dough into a rectangle, roll up the dough loosely, cut into slices, shake out the noodles and cook. That’s it! 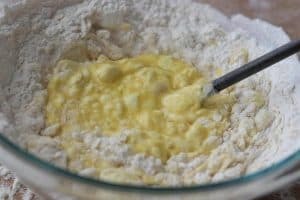 To make the noodles, combine the flour, baking powder and salt. Add in beaten eggs and 1/2 egg shell of water if needed. Just mix only until ball is formed, otherwise the noodles will be tough and not tender. Egg noodle dough ball ready to rest. Be sure to cover with a towel and let the dough rest for at least 15 minutes. Lightly roll out noodle dough. Don’t press hard. 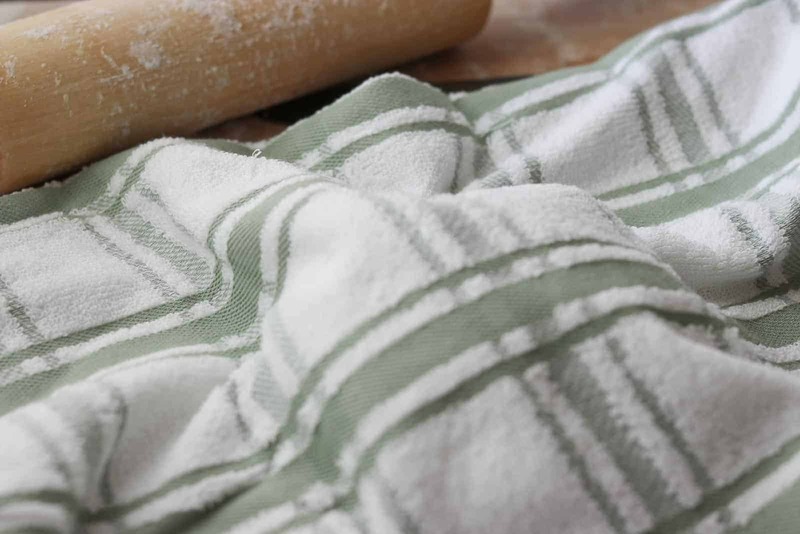 If dough seems sticky, add more flour to prevent it from sticking to surface or rolling pin. 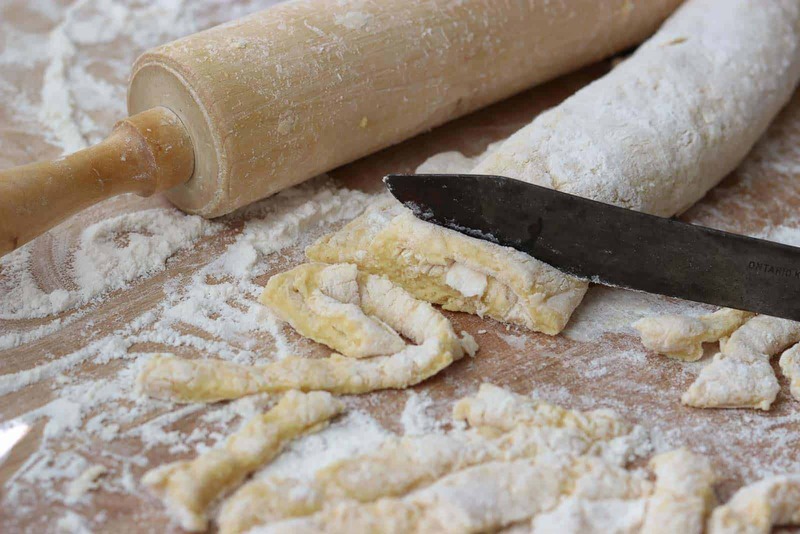 Cut dough into slices and shake or separate out noodles. If dough is sticky, dip each slice in a little flour before pulling it apart. Add homemade noodles to soup and cook for a few minutes. They will float up to the top. Soup is ready! You can also freeze the noodles separately for other uses. To do this, lay noodles on a baking sheet lined with parchment. Flash freeze for at least an hour then transfer to plastic or vacuum sealed bags until needed. Can you freeze chicken noodle soup and how do you do it? Yes, you can definitely freeze the soup! Make the soup, allow it to cool by dividing it into 2 portions and letting it cool overnight in the refrigerator. The next day, scoop 1 c. (or whatever portion size you desire) of soup and ladle it carefully into vacuum seal bags. With my sealer I don’t usually vacuum the bags or not much, but rather just seal (sometimes double seal) and lay flat on a baking sheet in a freezer until completely frozen. When I want a nice cup of soup, I thaw in the microwave for a few minutes, then transfer to a bowl or cup and reheat until hot. Don’t let the idea of, “Homemade Noodles,” scare you. 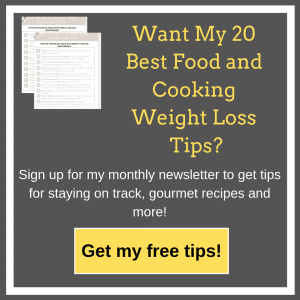 They are super easy to make and take no time at all. The noodles are so worth it in this delicious, comforting, healthy chicken noodle soup. I like to make a batch of this soup and serve it for dinner and then freeze the leftovers in 1 cup portion freezer seal bags. When anyone at my house is sick, I can instantly pull out my homemade soup and heat it up in a hurry. 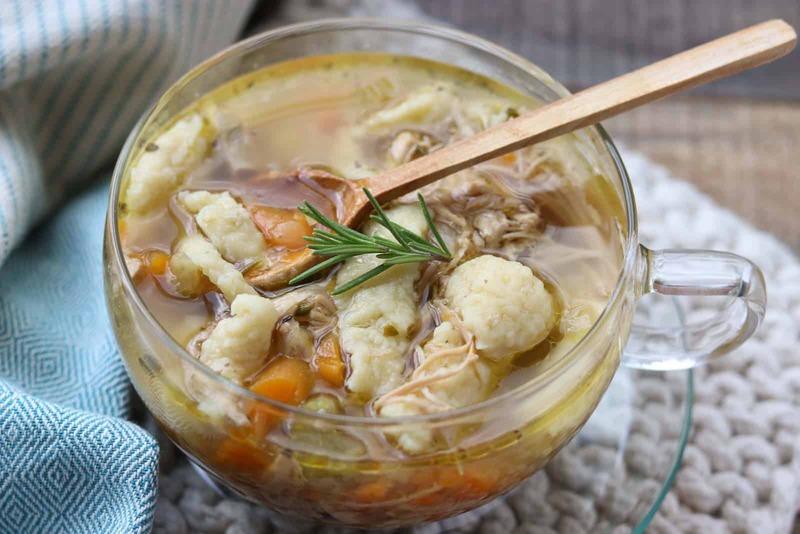 Place the stock ingredients into a 6 or 8 qt Instant Pot (chicken, onion chunks, 2 c. baby carrots, sliced head of garlic, turnip and parsnip chunks, Italian seasoning, bay leaves, ginger, salt, peppercorns, fresh rosemary and thyme). Add water. This should cover the chicken. Put lid on Instant Pot, set knob to sealing, and press manual (high pressure) and set time for 30 minutes. When finished, allow to sit for 10 minutes then release pressure. While Instant Pot is cooking, spray a non stick skillet with oil from Olive Oil Mister and set heat to medium high. Sauté ingredients for soup: chopped onions, minced garlic, carrots, turnips and celery. Cook about 10 minutes. Set aside. When Instant Pot is done, wait 10 minutes, then release pressure. Carefully strain out cooked vegetables with a slotted spoon and throw those away. Remove skin and debone chicken. Chop chicken into pieces and set aside. Add sautéed vegetables from skillet into Instant Pot. Add cooked deboned, skinned chicken pieces to the broth. Add herbs. Cover with lid, set to sealing again. Press, “Soup,” and decrease time to 10 min. When soup is finished, allow to soup to sit for 10 minutes, then release pressure. Adjust spices, add more salt and pepper if necessary. While the soup is cooking, in a medium bowl, mix dry ingredients. Add in eggs and mix with a fork until just blended. Add 1/2 egg shell of water if needed. Place dough on a heavily floured board. Knead for about 3 times, then cover with a towel and allow to rest at least 10-15 min. 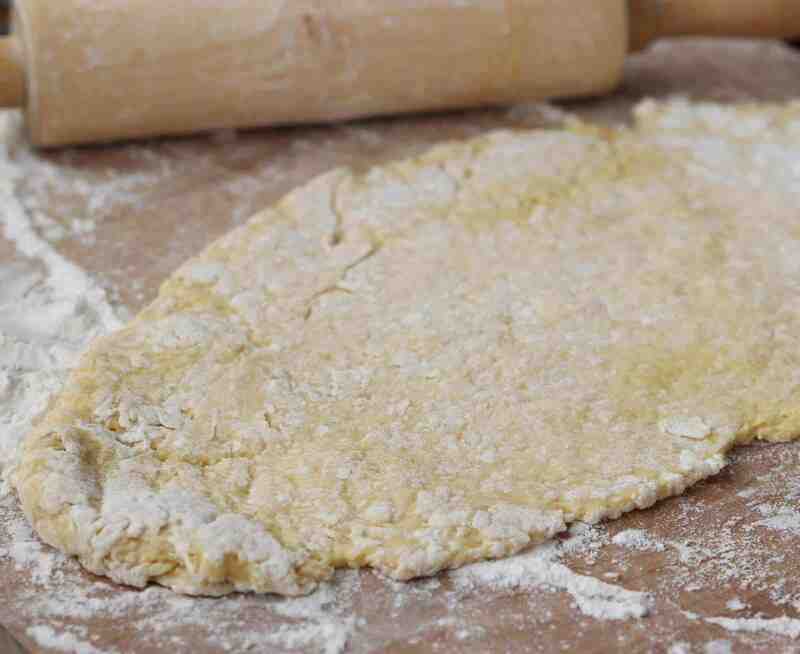 Lightly roll out dough into a rectangle about 1/2 inch thick, add flour often to prevent sticking. You don’t have to press hard at all. 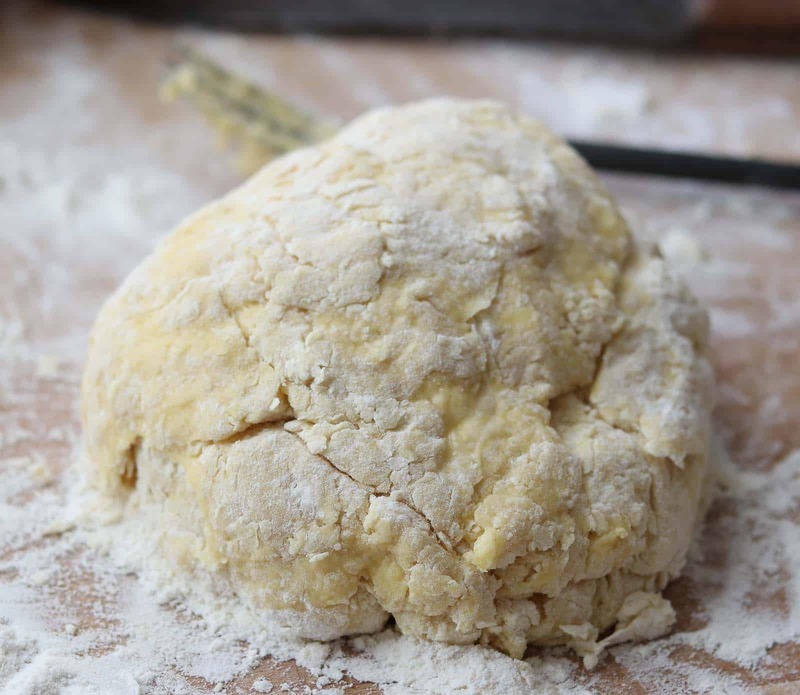 Place a little flour on top of rolled out dough. Roll up very loosely. Cut dough into 1/2 inch wide slices with a knife. If the slices seem sticky, dip each slice on both sides in flour before shaking out or separating the noodle. Be sure and check out the pictures in the post for clarification. Separate noodle strips and lay them on the floured board until ready to cook. If you roll them out too early, be sure and cover with a towel to prevent them from drying out. After soup is done, turn Instant Pot to, “Sauté,” add noodles using a floured spatula turner and cook a few minutes until done. Serve immediately or cool then freeze into 1 c. portions. If you must use store bought egg noodles ( I don’t recommend this, the homemade ones are way better!) they need to cook longer than the homemade ones. Put them in when you making the soup. I use my big 8 qt Instant Pot for this one, but you can easily make it in a 6 qt Instant Pot. During the last step when adding the noodles, if you think there isn’t enough room, just ladle out some of the soup into a bowl and then add the noodles into the Instant Pot and finish the recipe. No Replies to "Healthy Instant Pot Chicken Soup with Homemade Noodles"